3 days of non-stop tech, talks, workshops and a 48 hour programming competition. The goal of the Pixels Camp hackathon is to single out and reward creativity and innovation by providing participants with an opportunity to work together within a time frame of 48 hours to create something awesome. The Hackathon is the most important part of the event. Every candidate is advised to put a team together and take part in it. Participation is what makes Pixels Camp great. The more we have evidence that you participated in the hackathon and other activities, the more your chances of joining us next year improve. It is free form, so you can develop your own idea or pick challenges that our sponsors have prepared for this edition instead. Just make sure you have a prototype, product or a service to show us when the clock runs down! We don't expect you to come to Pixels Camp to attend a few talks, that's not the spirit. We expect you to join us for three days, all-in, participate, communicate, learn and teach, and network with the community. Last edition's blockchain based voting approach was a success. In fact, it worked so well that we decided to build an MVP out of it. This edition we're going to introduce you to TAIKAI, a blockchain-based open innovation platform. The principles are the same, TAIKAI makes full use of decentralization and transparency that blockchain technologies promise, including picking up the winning projects of this edition's Hackathon. The dynamics are of what you can find in the real world and a real economy. You can earn KAIs (TAIKAI's currency token) by participating in Pixels Camp activities, or by convincing others to transfer their tokens to you. When the voting starts, you can invest in the projects you like the most using your hard-earned tokens. In a nutshell: every participant can be an entrepreneur, an investor, a service provider, a customer, a marketing guy, a growth strategist, a CTO looking for help, a mentor and a trader. The Pixels Camp hackathon will run on TAIKAI's website. The Hackathon projects will also be submitted through TAIKAI. There's no need for wallets or dedicated software to vote or transfer tokens. You can only invest in the project when the voting opens. This will happen when the projects presentation starts on the Main Stage. Angels will also be listed on TAIKAI. They have more tokens than most users and will invest in the projects they think deserve it. The voting system is simply transfering your tokens to the projects you love. Every investment in a project, either coming from Angels, it's team members, good friends or general participants will be entirely traceable, transparent and incorruptible, by design. It may sound a little complicated, but there will be a section on TAIKAI in the opening Keynotes. Let's get started with the Hackathon rules now. Groups must be larger than 2 elements, all of whom must be Pixels Camp participants. Teams are advised to recruit elements with a wide diversity of interests that complement each other in their knowledge areas. The broader the skills in a team, the higher the probabilities to surprise the angels, investors and your peers with innovative ideas. You can use Slack, Twitter, Pixels Camp website or TAIKAI user directory to find your team members or you can meet them IRL on site when Pixels Camp starts. Participants can only be part of one project. Ideas, concepts, and team organization are tasks that can be thought out before the event, but the project itself should be developed during the 48 hour period. The hackathon projects must be submitted through TAIKAI's website. To register a new project for your team, log into TAIKAI using your GitHub account. 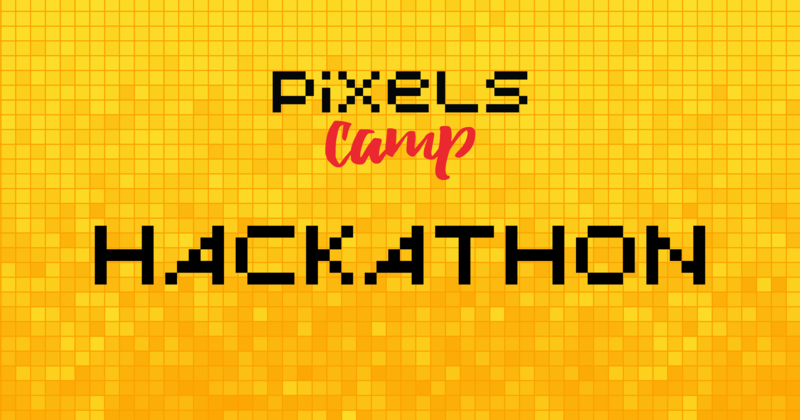 Head on to Pixels Camp Hackathon challenge page to create a project. From there you provide a title for your project, an intro (it will be used in the listings) and a full description. You can use Markdown in the description, to make it more attractive. Now you need to enter the members of your team, a pretty cover image for your project, an optional video if you have one and your code repository, also optional. When you think that everything's ready for the world to see, click "Publish". Press the "Edit" button whenever you feel like changing your project page. Once your project is published, you'll have access to its permalinked page. This is the page that everyone sees when your project is enabled. In the page, you'll see the title of your project, cover, logo, description and the team. Once it's public, you can share your project page with other participants. TAIKAI will promote the projects as soon as they are published. The sooner you get your project page up and running, the more chances you get to be invested. Projects will be listed on TAKAI's Pixels Camp Hackathon Challenge page and will also be highlighted on TAIKAI's homepage. A number will be attributed to the project based on the creation date. This will be the order by which they'll be presented on the Main Stage. Every team member is entitled to a seat at a table. You can ask any staff member to claim seats for your team. They will give you a special marker for your project. You can develop your own idea, but if you choose to respond to any sponsor challenges, make sure you read the provided documentation and don't forget to mention them in your project description. The sponsors will assign mentors that will be avaible during the event to help you with any questions you might have regarding your project. They will be wearing a lime green t-shirt with the word "mentor" so they're easily identifiable.